Designing with glass doors must be carefully considered or those previously concealed plastic 7-11 Slurpee cups and lidless Tupperware containers may become the kitchen’s focal point. Glass doors are a good way to break the pattern in a design of mostly solid doors, but deciding how to design with them can be quite a challenge, especially if you are not familiar with the options offered by IKEA. Orientation: Vertical cabinets (available in 30″ and 39″ high) are the most common choice – plus their two shelves allow for good storage space. 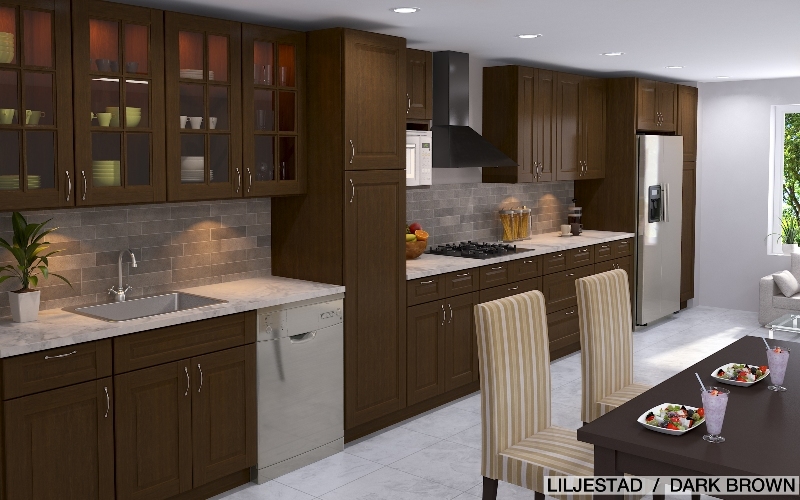 Horizontal cabinets (available in 15″ and 18″ wide) are used for more modern designs and to store larger items that don’t fit in vertical cabinets. When designing with horizontal cabinets keep in mind that the door opens up and if they’re too high it might be necessary to use a foot stool. Clear or Smoked Glass: This depends on the style and what’s to be stored inside the cabinets. Are the contents worth exhibiting? 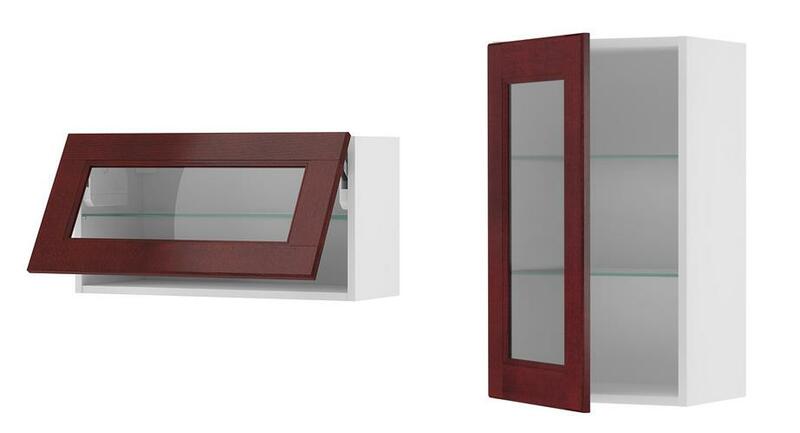 Solid shelves or Glass shelves: If the cabinets are to display decorative pieces, then glass shelves are best . . . especially if halogen lights will be installed. Solid shelves are best if displaying heavier items. Glass door frames: Mullions, Woodframes and Aluminum, are each tied to a particular IKEA door style for a reason: Mullions look best for traditional designs such as Lidingo and Liljestad. Aluminum goes best with contemporary and modern kitchens, such as Abstrakt, Harlig, Applad and Nexus. Woodframes, such as Adel and Ramsjo, compliment transitional designs.